I found a piece of really hard mahogany which will make a good bridge. 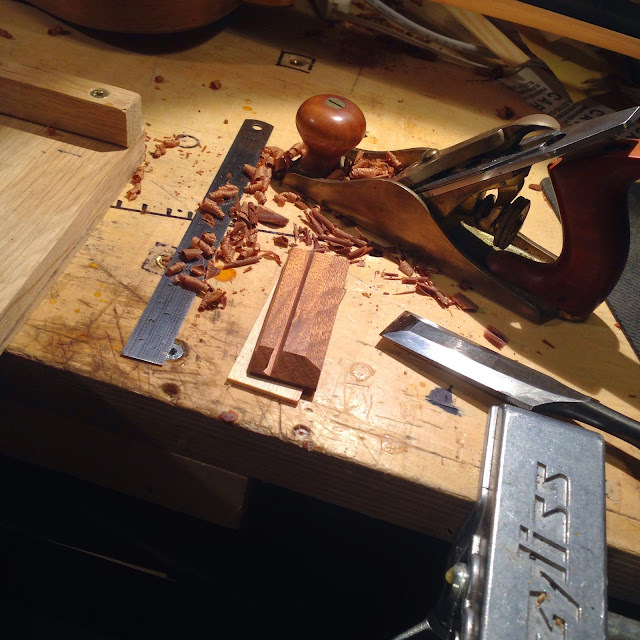 I shaped it with nothing but a chisel and my Leslie Nielsen no.1 plane. Both razor sharp. 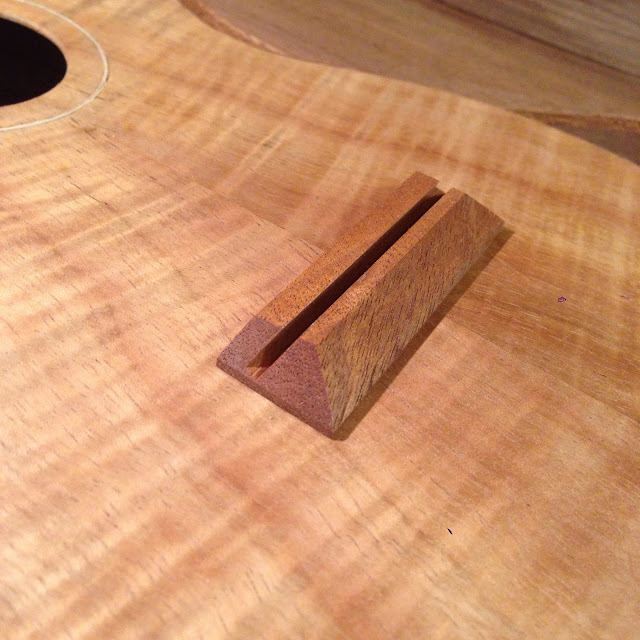 A dry fit, or more exactly; the bridge lying on top of the soundboard. 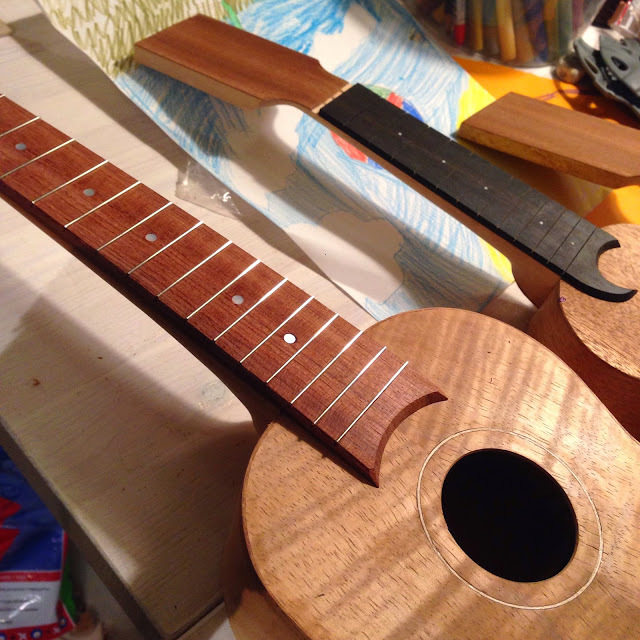 Fretting time! On the koa concert. 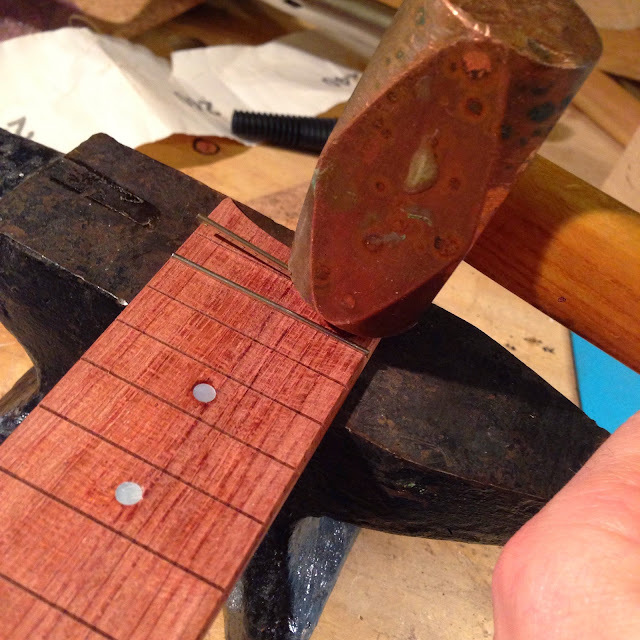 I've decided to try a method reminiscent of the one I use on the piccolos, which are fretted directly into the neck. I've cramped the fretwire into the fretboard before cutting it to length, then snipped it off with pliers before filing and sanding the ends flush with the board. 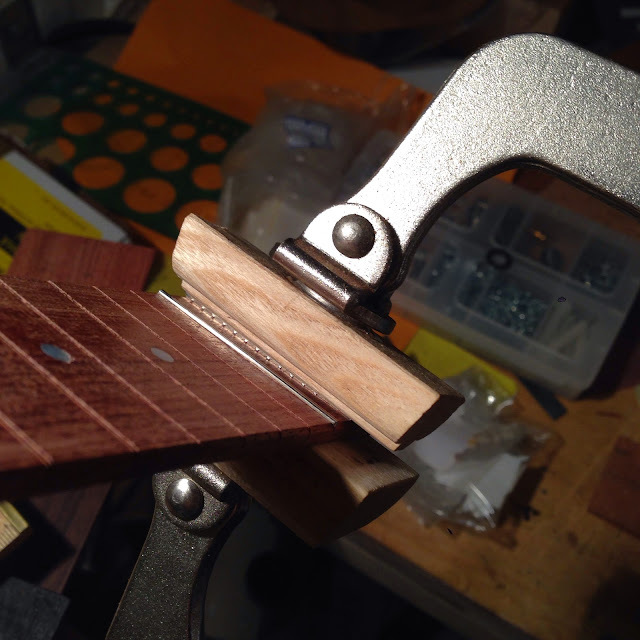 It works well enough but I want to minimize the risk of protruding fret ends if the fretboard dries out. Since it isn't possible to file and sand the frets on the piccolos I undercut the tang and shape the ends before pressing them in, and it's the undercutting I'm going to do on this fretboard. Here you can see what I rant about. The tang is cut at a 45 degree angle. To get the length right I measure it at the slot. 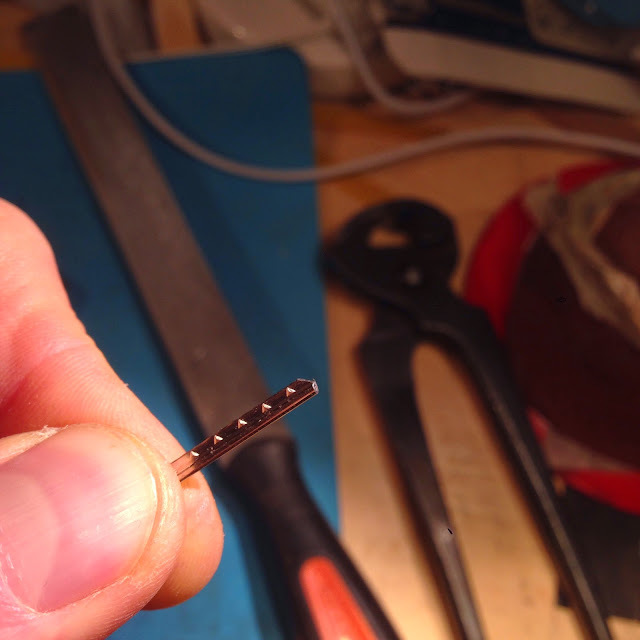 Always start with the longest ones; if you make them too short just move it a step or two closer to the nut end. As you can see that happened on the first fret tonight, that's why there's a seated one in the 14th slot while I'm working on the 15th. Give one end a tap with the hammer. I use a brass hammer on which I file and polish the face regularly. I start at one end and work my way across. It works really well, at least well enough for me to forget about the upgrades between the occasions it's used. In the last pic the whole board is fretted and lies on the neck. The slight backbow disappears when it's glued on. 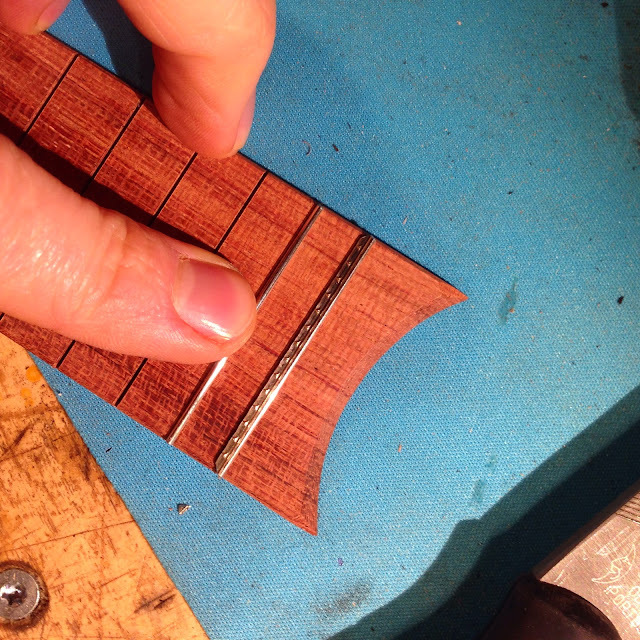 I will show the file work in a later post, on this fretboard or on another.